Flybusters' Ecobuster contains the following combination of substances. The working of pyrethrins are explained in this article published by the Cornwell University. Pyrethrum is a perennial herb with white-yellow flowers. The heart of the flower is yellow, and around with white and separate petals. It can grow to a height about 60-70cm, at altitude between 1.200M and 3.000M. The plant was once grown alongside the Dalmatian coast in Yugoslavia (once known as the Dalmatian insect flowers). Pyrethrum is a natural botanical insecticide with a long history. It is a valuable plant that contains some active insecticidal ingredients, and no toxicity to warm blood animals. Its insecticidal properties were documented in the early 1800s. 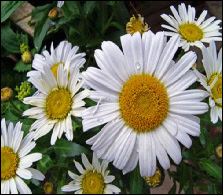 Since 1885, pyrethrum was planted in Japan and had had a fast development. Pyrethrum output in Japan once had an important role and reached to 10,000 tons per year before the Second World War. Later, the Japanese pyrethrum output gradually decreased because of the barren soil and the poor climate. After 150 years, its usage is now replaced by focusing on the Extract of crops grown in Kenya, Tanzania, Rwanda and Papua. Pyrethrins is extracted from dried pyrethrum flower and contains six insecticidal active components, with BSI name: Pyrethrin I, Pyrethrin II, Cinerin I, Cinerin II, Jasmolin I and Jasmolin II. Since pyrethrins can be decomposed quickly into water and carbon dioxide under sunlight or in the air, the pesticide or the household insecticide made of pyrethrins, is no residue and no harm to warm-blood animals, and considered as the most secure natural insecticide. Pyrethrins is potent, no worry of insect resistance, and a direct contact insecticide which means pyrethrins has a rapid paralytic action or “knockdown” death in a short time. So the spray formulated by pyrethrins can be used to kill insects in the household; the pesticide formulated by pyrethrins is potent for killing pests in vegetables, fruits and teas etc.